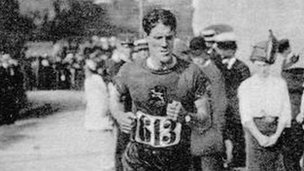 Kennedy Kane McArthur was greeted him with a torchlight procession when he returned to his home town of Dervock, Co Antrim, after winning the marathon at the 1912 Olympics in Stockholm. So it is only fitting that Dervock is included on the London 2012 Olympic torch relay route through Northern Ireland on the centenary year of that victory. McArthur's life story reads like that of a comic book hero such as Alf Tupper. He enjoyed chips for breakfast and smoking a pipe after his triumphs. The former postman caught the running bug while delivering letters as a young man in Co Antrim. "Kennedy Kane McArthur went over to South Africa as a young man, but there are plenty of accounts of him running during his post round and delivering the letters as fast as he could. He would race the narrow gauge railway engine as it went by." McArthur was unconventional compared to modern athletes - a bulky individual who still had the ability to run long distances. "He ran six marathons in his career from 1908 to 1912 and he won them all which is a phenomenal record. There is talk that at the Durban Marathon in 1910 where he finished 15 to 20 minutes ahead of his nearest rival, he was seen leaving the stadium smoking a big pipe of South African tobacco." At the Olympic marathon in Sweden, one athlete died in the sweltering temperatures and McArthur is believed to have been spurred on by a cry from home in the closing stages. In those days there would have been refreshment stops, with a cup of tea or a glass of champagne rather than the energy drinks of today. As McArthur ran towards the finishing line someone threw a garland around his neck, nearly knocking him to the ground. "He was so tired and was struggling to reach the line, but the legend has it that someone shouted from the crowd 'Come on Antrim come on ye boy ye' and he found the last bit of strength to finish. The crowd carried him in their arms afterwards." McArthur's athletics career ended a year after his Olympic victory when he injured himself in a freak accident while on patrol as a police officer. In 2012, Ballymoney Museum will brings his medal and trophies back to Northern Ireland from South Africa for a special exhibition. McArthur stadium in Potchefstroom where he settled is named after him. "When he died in 1960, his widow presented his medals and trophies to the museum in Potchefstroom and they have agreed to let us borrow them next year. "The Olympic gold medal is missing, no-one is quite sure where it is, but we will be displaying his Olympic blazer and the running number from his shirt. "We have been talking to his relatives and they have a book that was presented to him in 1912 when he returned to Ballymoney and they want to come here next year to bring that across." 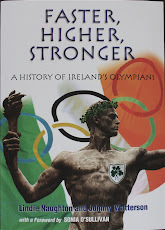 Dervock is planning to hold a centenary marathon in McArthur's memory next year with Stockholm following suit. Mr Beattie said the flames and trains which helped spark this marathon messenger's passion for running would also be recalled in his home village. "The exhibition we are planning will run from April to September and we have been generously supported by the Heritage Lottery Fund," he added. "They are also helping us with another project which will be a play about McArthur's life which will coincide with the centenary. "When he arrived back here by train after winning the Olympic gold there was a large crowd waiting for him at Ballymoney station and our plan is to reenact that at the station. "He was put into a carriage and the people of the town unharnessed the horses and pulled him themselves to the town hall for a reception. "When he arrived at Dervock there was a crowd of people waiting and a torchlight procession and we hope to reenact that as well." Ireland has qualified three riders for the London Olympics road race next year. Thanks to the achievements of Daniel Martin, Nicolas Roche and Philip Deignan, Ireland ends the season with a world ranking of 13 - enough to book a place at London 2012.